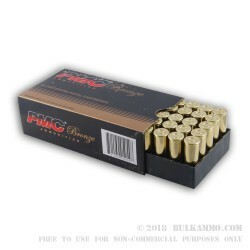 PMC is producing top tier handgun ammunition and this .44 Rem. Mag ammunition is a great example of what is possible at the price point because the commitment that the PMC line has to delivering value for money. It is a suitable candidate for any type of shooting and is more than capable of being a hunting round or a self-defense round. This is a 180 grain projectile with the classic soft point, jacketed hollow point with a copper clad skirting. It is a style that isn’t as prevalent as it once was, but which takes nothing away from the performance aspect of the cartridge. Built on a premium brass casing, this aspect of the round is important, because PMC is a line from South Korean producer Poongsan corporation, whose primary business is in widespread manufacturing of non-ferrous metals, particularly copper, lead, bronze and brass. This positions the company well to produce ammunition and is part of the reason that PMC ammunition is always so reasonably priced. This cartridge case is Boxer primed and so, very affordably and easy to reload the spent casings. The relative performance for the money makes this a standout contender on the lower end of the price spectrum. Want to get even more bang for your buck? Check out the bulk case of this same 44 mag ammo for sale here. Review by Elk Grove Shooter J.
I fire this through my Henery Big Boy 44 Mag and my Taurus Tracker 44 Mag. Shoots strong, clean, and very reliable! 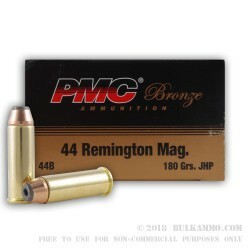 A: These 44 Magnum rounds from PMC feature a jacketed hollow point bullet. The smaller versions of the pictures may make them appear as a soft point bullet. Clicking and zooming in on the images should show the cavity of the hollow point. If you have any additional questions about this or any product, please feel free to e mail us.